Listen up, all you cuddlers! Backcountry spooning isn’t a figment of your imagination — it’s possible without the extra weight and bulk of your home comforter. Meet the Big Agnes line of ‘double’ sleeping gear. My wife and I have been backcountry hiking and camping in various national parks this summer. And we’ve been more willing to abandon the comforts of our RV in favor of a night under the stars. With our new setup, we’ve replaced individual mummy sleeping bags with a spacious, cuddle-friendly double sleeping bag and pad. The Big Agnes Sentinel 30 double sleeping bag weighs in at 3 pounds 9 ounces, which is actually lighter than our two mummy bags combined. It’s specifically built to pair with our 2-pound 3-ounce Big Agnes Q-Core SLX insulated double-wide sleeping pad. Altogether, the setup feels like home: warm, spacious, and comfortable. One of the best parts about the Sentinel 30 is that it’s lighter and more compact than our previous backcountry setup. I used a Kelty Ignite DriDown 20 and my wife slept in a Marmot Angel Fire. Combined, those bags weighed 5 pounds 8 ounces. In addition, the Sentinel 30 packs down smaller than those two sleeping bags combined. If the weight and bulk savings weren’t enough, the double bag is also darn comfortable. 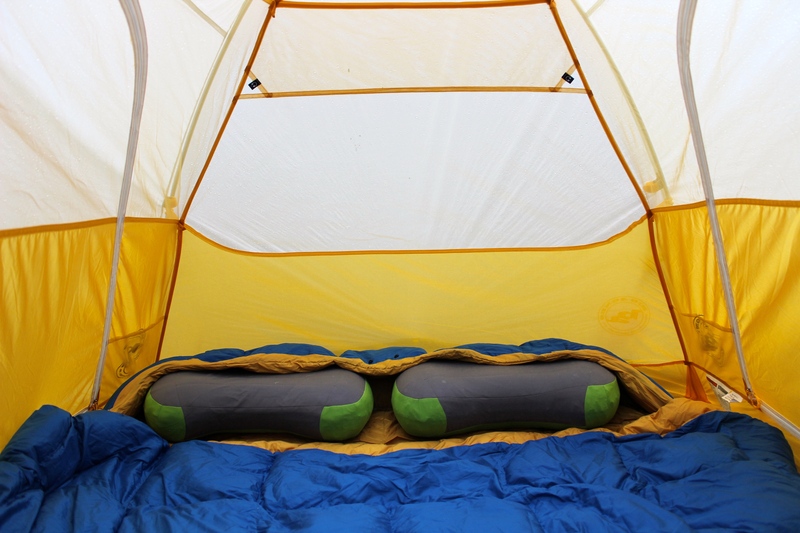 Its integrated pad sleeve fits our Q-Core SLX insulated double-wide sleeping pad perfectly and keeps it from sliding off. And its two cinchable hoods retain warmth without being constricting. The integrated Pillow Barn sleeve keeps our pillows in place all night. Its rectangular shape and quilted construction give that home comforter feel and allow for a variety of sleeping positions. I’m 5 feet 11 inches and my wife is 5 feet 3 inches, both with athletic builds. In the bag, we can cuddle close or spread out with ample space to sleep. The bag’s 600-fill DownTek water-repellent down gives it a 30-degree rating when paired with an insulated sleeping pad. In our experience, the addition of the other’s body heat helps the bag remain comfortable in temperatures near its limit. In the backcountry of Yellowstone National Park, temps dipped below 35 degrees and we stayed warm. (Though we did bring along a light down blanket that we draped across our shoulders for more encompassing coverage.) The bag’s cinchable mummy hoods and a snapping hood divider provide fine shoulder-to-head coverage. But it’s certainly more open and breezy than individual mummy bags tend to be. The top of the bag is plump with down fill while the bottom’s insulation is minimal. Dubbed “The Big Agnes System,” a pad sleeve replaces the bag’s bottom insulation to accommodate an insulated sleeping pad. That way, the pad provides the bottom insulation, a move that shifts the bag’s insulation where it will perform best (on top rather than compressed by your body weight on the bottom). On the warmer nights, the zippers on each side zip down to the foot to increase airflow. Even on nights as warm as 60 degrees, we didn’t burn up inside the 30-degree bag. The 600-fill down compresses well, and the bag fits easily inside the provided stuff sack that measures 9 x 20 inches. The $370 price tag is a tough one to swallow, but it’ll cost you less than buying two quality individual mummy bags. And you can find often find it on sale. Bag weight: 3 lb. 9 oz. 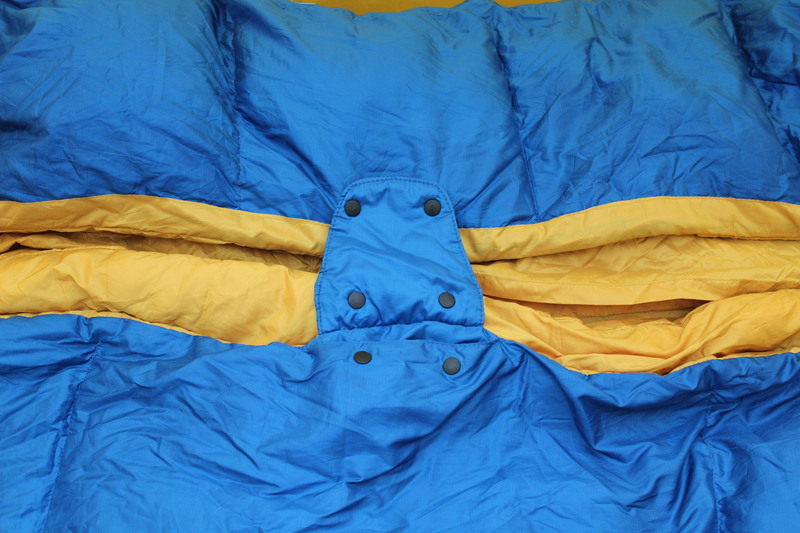 As mentioned, the Sentinel 30 sleeping bag has an integrated pad sleeve that’s built to fit the brand’s insulated double sleeping pad (or two individual sleeping pads). 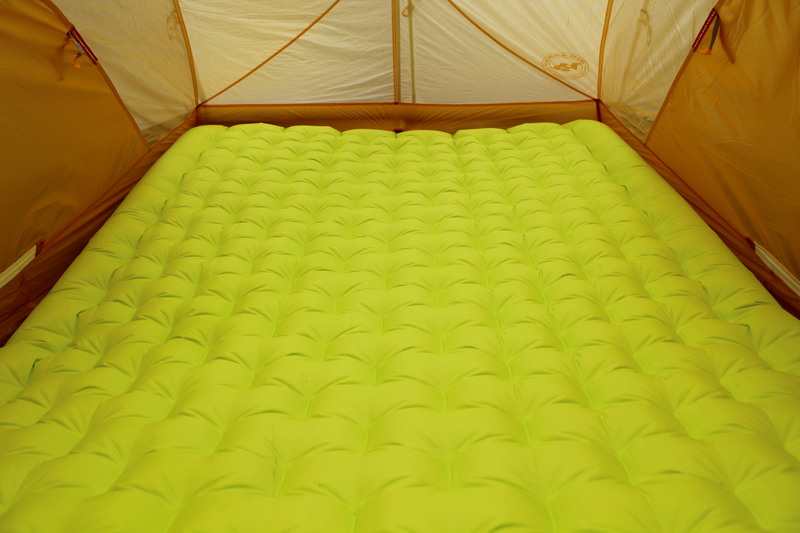 We use the Q-Core SLX insulated double sleeping pad ($250) to avoid sliding in the middle crack of two pads when cuddling. 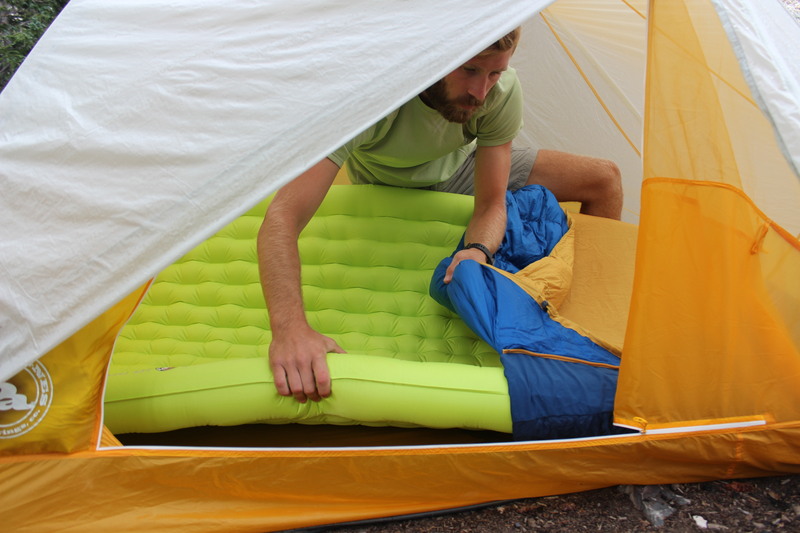 When inflated, the pad slips into the sleeping bag sleeve and slides from the foot to the head, where stretchy corner sleeves keep it in place. The pad isn’t super light at 2 pounds 6 ounces, but it’s insulated and plenty thick. To inflate the 3.5-inch-thick double pad, there’s an inflate valve that you blow into. With that alone, it would take some time and energy to fully inflate it. We opted for the extra Pumphouse Ultra bag ($35) that you connect to the inflate valve, blow a mouthful of air into, then roll the top and squeeze the full bag of air into the pad. The contraption is extremely handy, weighs next to nothing (2.9 ounces), and significantly speeds up the process of inflating the pad. Inside the inflator valve is a tiny micro-adjust button that lets a little bit of air out to adjust for optimal comfort. A separate air-dump valve quickly deflates the pad, which then rolls up nicely into the provided stuff sack. The pad has I-Beam construction that provides stability without creating uncomfortably large humps. It’s plenty wide for two people at 40 x 72 inches and is rated to 32 degrees. The nylon ripstop fabric is durable, though we did make the mistake of carrying it on the outside of our backpack, unintentionally scraping it against tough walls in Canyonlands National Park. At one point, I caught it on a sharp rock, which cut through the stuff sack and punctured a small hole in the pad itself. The provided repair kit worked like a charm, and we were able to quickly and effectively patch the pad that night. And we’ve had no problems since. On every three-season backpacking trip, we’re packing the same setup: Big Agnes Tiger Wall UL2 tent, Sentinel 30 double sleeping bag, and Q-Core SLX Insulated double sleeping pad. Instead of carrying five items — a tent, two sleeping bags, and two sleeping pads — we carry only three. In the end, we’re more comfortable, which helps keep the spirits high on multinight, long-distance backpacking trips. The double bag and pad together will set you back a chunk of change: $620 if you pay full price. 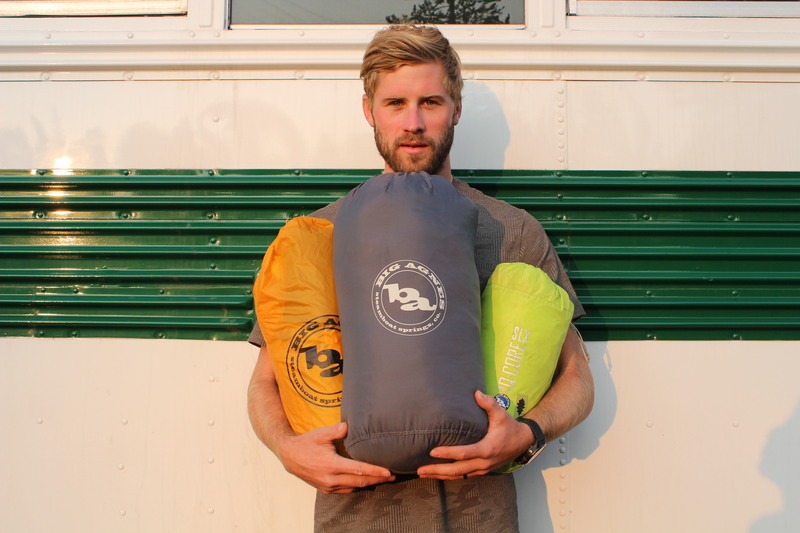 It’s no small investment, but it’s worth considering before you begin shelling out money for two separate sleeping bags and pads. And don’t forget the cuddling as an added bonus for the double. My wife and I are pretty smitten by the set. 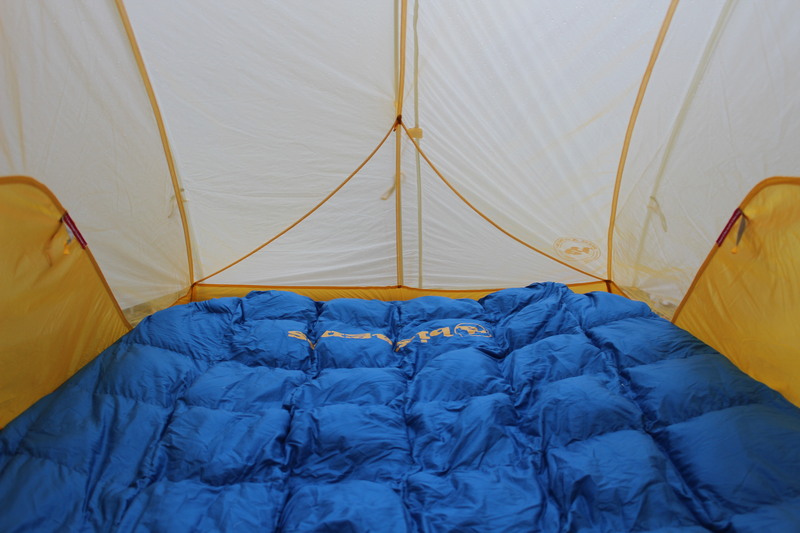 We’re particularly happy with the weight and bulk savings and are game for more backcountry camping due to its home-like comfort and cuddle factor. The gear is high quality, and we expect it to last us many years. So remember to take that into consideration before balking at the price tag. The post Big Agnes Double Sleeping Pad, Bag Review: Cuddling in the Backcountry appeared first on GearJunkie.